Residents living near the Port of Albany, in the Albany South End community, have voiced concern about potential air quality impacts due to the movement and storage of crude oil in the area. Residents asked the New York State Department of Environmental Conservation (NYSDEC) to perform a survey of air quality in the area. NYSDEC staff met with residents in the community and designed a short-term air quality screening to address the community's concerns. NYSDEC staff explained that the area has many sources of air contaminants, including those from the Kenwood rail yard as well as from stationary sources, industry, local space heating and from mobile sources on nearby Interstate 787 and other roadways. What did the screening do? 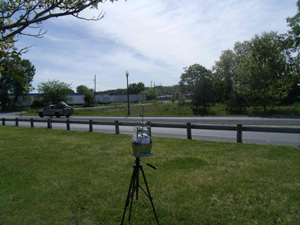 The design of the screening included 1-hour samples collected by NYSDEC simultaneously at three locations in the Albany South End community on five separate days. Samples also were collected on six days by a community volunteer. While the NYSDEC samples were collected when meteorological conditions favored potentially high air contaminant concentrations, the samples collected by the community volunteer targeted instances of public complaints and petroleum odor episodes. All samples were analyzed by NYSDEC's laboratory for a suite of air contaminants known as Volatile Organic Compounds (VOCs). These air contaminants volatilize readily into the atmosphere and are part of the composition of crude oil and petroleum products. Additionally, the samples were analyzed for specific light-weight alkanes which have been identified as components of crude oil originating from the North Dakota and Saskatchewan Bakken formation. The Screening found no unusual results. Download the full Albany South End Community Air Quality Screening Plan (1.7 MB PDF) - April 29, 2014. The results for the VOCs are below NYSDEC's short-term health-based air concentration values and are similar to concentrations routinely found at other locations in the State. The results for the light-weight alkanes are below NYSDEC's health-based air concentration values. In conclusion, none of the concentrations of air contaminants are considered to be of immediate public health concern and all concentrations were similar to what is measured in other locations of the State. NYSDEC will monitor baseline concentrations of formaldehyde and hydrogen sulfide because the community expressed concern that these two air contaminant concentrations. Formaldehyde is a contaminant that can be emitted from a source or formed through photochemical reactions in the atmosphere. NYSDEC began monitoring in May 2014. The NYSDEC has recently procured a portable hydrogen sulfide instrument and will develop the necessary protocols to commence a neighborhood survey of hydrogen sulfide concentrations in the Albany South End community. NYSDEC expects to find hydrogen sulfide in the community from the activities at the wastewater treatment plant, south of the Kenwood rail yard and the open grates of the sewer system in the City. Sampling now will provide information on existing concentrations of hydrogen sulfide. How can I get the report appendices? What are the locations of the neighborhood samples? Here is a map showing the locations of the samples collected by NYSDEC and the community volunteer.